This Irish blessing plaque features the Claddagh symbol along with Celtic knots and it is suitable as garden decor. This Irish blessing plaque features the following saying: With these hands I give you my heart and crown it with my love. 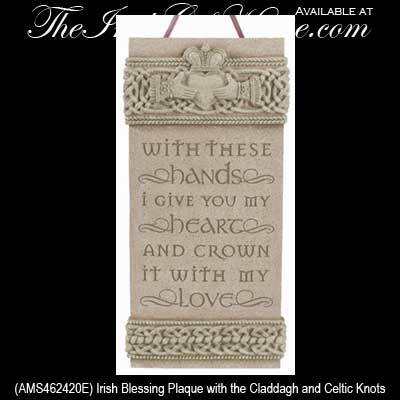 This Irish blessing plaque pays a tribute to the iconic Claddagh and it is enhanced with Celtic knot-work. The Claddagh blessing plaque is made of a cement and resin combination that is suitable for outdoor use; the dimensional design measures 4" wide x 7" tall. The Irish blessing is ready to hang on your wall with the included cord and it is gift boxed with Claddagh and Celtic knot history cards, complements of The Irish Gift House.